As follow-up to his lecture on native violets, Mike Hough will lead a walk at Upper Buttermilk Park, where several species can be found. 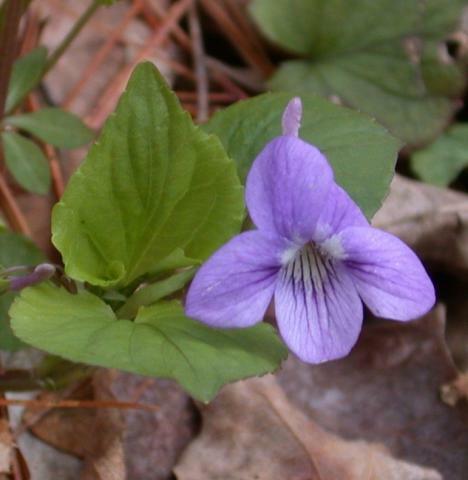 Mike will focus on identifying common violets of the Finger Lakes and other spring wildflowers. If time allows we may travel to another site nearby. Meet at CCE at 1:00 pm to carpool to the site. Parking fees may be in effect at the park, but you can meet the group at the parking lot for Upper Buttermilk (next to the playground) by 1:20pm. What a wonderful spot for an early spring walk! Lush, lovely - so many great ephemerals, ferns, and of course, violets. We saw at least 7 species of Viola and one hybrid violet within a relatively short walk. The photo is of the Viola rostrata hybrid, by Mike Hough. Particularly interesting or prominent species are listed to the right. The list below covers all the plants "well identified" on the walk. Listings with just a genus, no specific epithet (e.g. Genus sp.) should be taken as indicative of the environment only. We did not take the time to key these plants completely, important features were not visible, etc. but there was general agreement on the genus.